Massachusetts tenants who have experienced a hard time getting back their security deposit even after sending a request letter to the landlord need to send this Security Deposit Demand letter. The state laws in Massachusetts clearly states that the landlord can make deduction only to cover unpaid rent costs and damages beyond typical wear and tear of which they must provide an itemized list with receipts as proof. The statutory time for returning the tenant’s security deposit is 30 days and beyond that, it is considered unlawful and in “bad faith”. The tenant has the right to go to court and file a case against the landlord for wrongfully withholding their security deposit. Pursuant to the laws of Massachusetts, landlords defaulting to pay back the owed security deposit in time risk paying treble damages on the withheld amount if the matter ends up in court. This Security Deposit Demand letter warns the landlord that they stand to face tough consequences and also reminds them that it is in their best interest to settle the matter out of court. Filing a lawsuit can take a lot of time, but simply downloading this letter, filling it and sending it to the landlord is a simple, yet effective process that can be done in minutes. Usually, a professionally written security deposit demand letter is all that one needs to get back the owed security deposit. Any correspondence or agreement you reach with the landlord should always be in written form to have proof if the conflicts ends in court. Be sure to make your own copy of this letter and send it via certified post to get a return receipt . 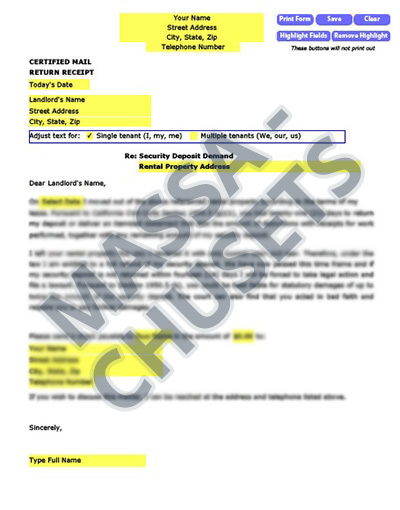 Our letters for Massachusetts renters are tailored to your state, with the right laws to get your landlord’s attention. We’ve taken care of the Security Demand details so there’s no hassle on your part to find the right law and craft an approrpriate letter. Our letters have been used in Massachusetts and all over America with great success.